It appears that the stock market is also driven by "animal spirits" or sentiment (psychology). Animal spirits is the term John Maynard Keynes used in his 1936 book The General Theory of Employment, Interest and Money to describe the instincts, proclivities and emotions that ostensibly influence and guide human behavior, and which can be measured in terms of, for example, consumer confidence. It has since been argued that trust is also included in or produced by "animal spirits". There is a valuable market indicator called the “St. Louis Fed Financial Stress Index.” According to the St. Louis Fed, this indicator was created in 2010 after economists sought a better way to track U.S. financial system stress in the wake of the 2008 financial crisis. 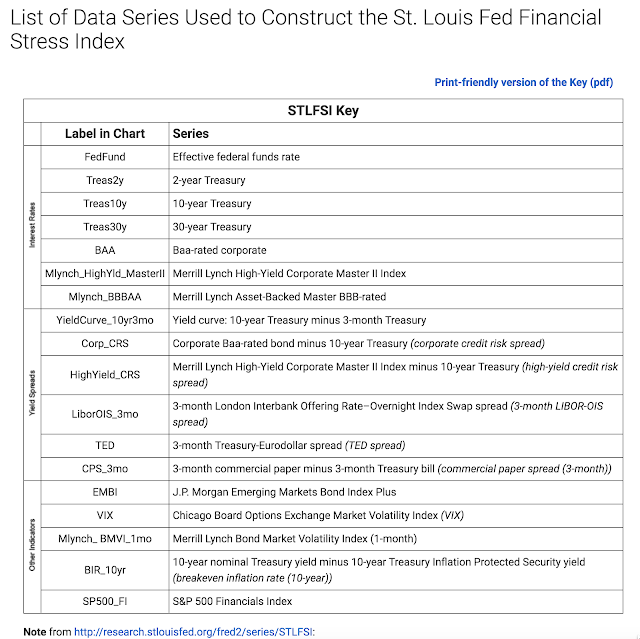 This index uses 18 weekly data series: seven interest rate series, six yield spreads and five other indicators (mostly sentiment-related indicators). When the index is very high (such as in 2008), it means that the U.S. financial system is experiencing a great amount of stress. When the index is low (such as during an economic expansion and bull market), it means that the financial system is experiencing a low amount of stress and investors accept advice from their advisors. The current stress indicator is below zero, which means that there is not much of an incentive for retired people to change their established portfolios. As shown, the build-up for placid acceptance can change radically and on the advent of a severe recession (a loss in the market of over 40%). In the 2008 recession the stress index peaked two years after the recession bottomed. A review of two past investor "stress cycles" shows that the stock markets experienced two lengthy periods of investor placid conduct while keeping stress levels below zero (e.g. the periods from 2003 through 2007 and the unusually confident periods from 2010 to date). The only conclusion one can draw in view of the current situation is anticipate the possibility of a sudden and precipitous upsurge in stress following the current experiences of no stress. If the past stress cycle can be used as a possible forecast the investor stress levels will peak after the recession has already bottomed. Market timing a recession could be useful, but only if it happens fast and before stress levels peak. Investors suffer maximum losses when they sell some of their portfolio at peak when the stress has peaked.